According to the latest batch of US Commodity Futures Trading Commission (CFTC) data, retail forex funds held at brokerages registered to operate in the US have decreased by 6% during the month of December. Two entries have been delisted as KCG Americas LLC has been taken over by Wedbush Securities, while Institutional Liquidity LLC has been removed from the list after leaving the tightly regulated US market. After steady growth in November, an unusually volatile month of December has led to outflows. While all eyes are on the January and February data which will show how the SNB decision has impacted the funds held at US forex brokers, the December set of numbers shows that while FXCM Inc. (NYSE:FXCM) has remained in the lead, funds held at the brokerage have dropped by 12% in December, which is double the average industry decline. Pre-holiday redemptions have led to declines across the board with the only major company registering growth being IBFX, as funds which TradeStation clients held at the brokerage grew almost $1 million. GAIN Capital remained flat, while client funds at OANDA dropped by about 4%. MB Trading was the second biggest decliner bleeding about 10% of customer deposits, as Interactive Brokers remained below the industry average shedding close to 5% in what is a typically slow month for the foreign exchange industry. 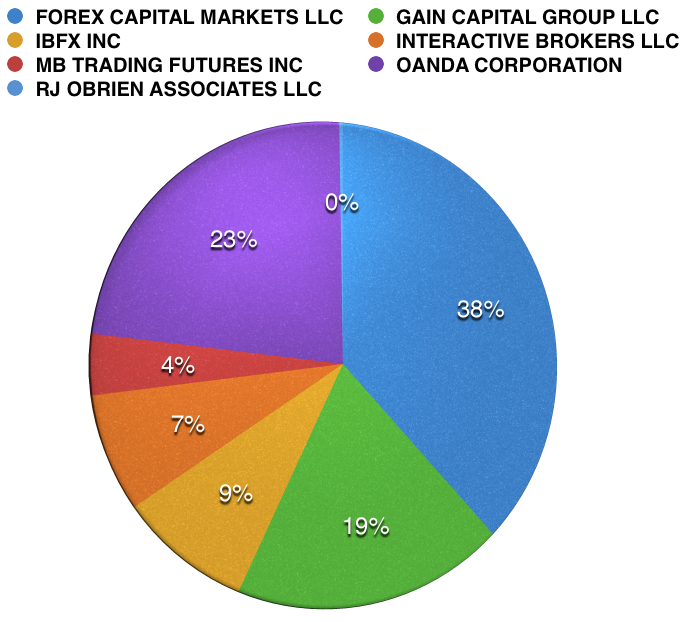 Looking at the market share of major brokers, we are seeing FXCM remain in the lead by a big margin, followed by OANDA and GAIN Capital. The bottom part of the chart remained consistent, with IBFX being followed by Interactive Brokers and MB Trading. Q1 reporting will be interesting. If they are around by end of Q1, that is.